MK Gandhi’s Pearls of Thought (366 days of each year). A Beneficient Rosary Of A Votary To God. Mohan Mala Compiled 1949. October 2, 2013. Today’s date. “What chiefly distinguishes man from the beast is that man from his age of discretion begins to practice a life of continual self-restraint. God has enabled man to distinguish between his sister, his mother, his daughter and his wife.” A law of value for moral humanity for ages to come. Practice it today. Katherine Mayo’s “Libelous Insult To All That Was Indian.” From Her Propagandist Book “Mother India.” Approximately around 1925. The area we know as India is nearly half as large as the United States. Its population is three times greater than ours. Its import and export trade–as yet but the germ of the possible–amounted, in the year 1924-25, to about two and a half billion dollars. And Bombay is but three weeks’ journey from New York. Under present conditions of human activity, whereby, whether we will or no, the roads that join us to every part of the world continually shorten and multiply, it would appear that some knowledge of main facts concerning so big and today so near a neighbor should be a part of our intelligence and our self-protection. But what does the average American actually know about India? That Mr. Gandhi lives there; also tigers. 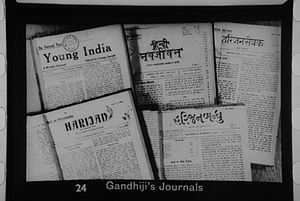 His further ideas, if such he has, resolve themselves into more or less hazy notions more or less unconsciously absorbed from professional propagandists out of one camp or another; from religious or mystical sources; or from tales and travel-books, novels and verses, having India as their scene. It was dissatisfaction with this status that sent me to India, to see what a volunteer unsubsidized, uncommitted, and unattached, could observe of common things in daily human life. Leaving untouched the realms of religion, of politics, and of the arts, I would confine my inquiry to such workaday ground as public health and its contributing factors. I would try to determine, for example, what situation would confront a public health official charged with the duty of stopping an epidemic of cholera or of plague; what elements would work for and against a campaign against hookworm; or what forces would help or hinder a governmental effort to lower infant mortality, to better living conditions, or to raise educational levels, supposing such work to be required. None of these points could well be wrapped in “eastern mystery,” and all concern the whole family of nations in the same way that the sanitary practices of John Smith of 23 Main Street concern Peter Jones at the other end of the block. Therefore, in early October, 1925, I went to London, called at India Office, and, a complete stranger, stated my plan. “What would you like us to do for you?” asked the gentlemen who received me. To such Indians as I met, whether then or later, I made the same statement. In the period that followed, the introductions that both gave me, coupled with the untiring courtesy and helpfulness alike of Indians and of British, official or private, all over India, made possible a survey more thorough than could have been accomplished in five times the time without such aid. Those journeys I made, plus many another up and down and across the land. Everywhere I talked with health officers, both Indian and British, of all degrees, going out with them into their respective fields, city or rural, to observe their tasks and their ways of handling them. I visited hospitals of many sorts and localities, talked at length with the doctors, and studied conditions and cases. I made long sorties in the open country from the North-West Frontier to Madras, sometimes accompanying a district commissioner on his tours of checkered duty, sometimes “sitting in” at village councils of peasants, or at Indian municipal board meetings, or at court sessions with their luminous parade of life. I went with English nurses into bazaars and courtyards and inner chambers and over city roofs, visiting where need called. I saw, as well, the homes of the rich. I studied the handling of confinements, the care of children and of the sick, the care and protection of food, and the values placed upon cleanliness. I noted the personal habits of various castes and grades, in travel or at home, in daily life. I visited agricultural stations and cattle-farms, and looked into the general management of cattle and crops. I investigated the animal sanctuaries provided by Indian piety. I saw the schools, and discussed with teachers and pupils their aims and experience. The sittings of the various legislatures, all-India and provincial, repaid attendance by the light they shed upon the mind-quality of the elements represented. I sought and found private opportunity to question eminent Indians–princes, politicians, administrators, religious leaders; and the frankness of their talk, as to the mental and physical status and conditions of the peoples of India, thrown out upon the background of my personal observation, proved an asset of the first value. And just this excellent Indian frankness finally led me to think that, after all, there are perhaps certain points on which–south, north, east and west–you can generalize about India. Still more: that you can generalize about the only matters in which we of the busy West will, to a man, see our own concern. John Smith of 23 Main Street may care little enough about the ancestry of Peter Jones, and still less about his religion, his philosophy, or his views on art. But if Peter cultivates habits of living and ways of thinking that make him a physical menace not only to himself and his family, but to all the rest of the block, then practical John will want details. “What this country suffers from is want of initiative, want of enterprise, and want of hard, sustained work,” mourns Sir Chimanlal Setalvad. 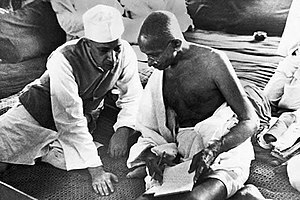 “We rightly charge the English rulers for our helplessness and lack of initiative and originality,” says Mr. Gandhi. The British administration of India, be it good, bad, or indifferent, has nothing whatever to do with the conditions above indicated. Inertia, helplessness, lack of initiative and originality, lack of staying power and of sustained loyalties, sterility of enthusiasm, weakness of life-vigor itself–all are traits that truly characterize the Indian not only of today, but of long-past history. All, furthermore, will continue to characterize him, in increasing degree, until he admits their causes and with his own two hands uproots them. His soul and body are indeed chained in slavery. But he himself wields and hugs his chains and with violence defends them. No agency but a new spirit within his own breast can set him free. And his arraignments of outside elements, past, present, or to come, serve only to deceive his own mind and to put off the day of his deliverance. Take a girl child twelve years old, a pitiful physical specimen in bone and blood, illiterate, ignorant, without any sort of training in habits of health. Force motherhood upon her at the earliest possible moment. Rear her weakling son in intensive vicious practices that drain his small vitality day by day. Give him no outlet in sports. Give him habits that make him, by the time he is thirty years of age, a decrepit and querulous old wreck–and will you ask what has sapped the energy of his manhood? Take a huge population, mainly rural, illiterate and loving its illiteracy. Try to give it primary education without employing any of its women as teachers–because if you do employ them you invite the ruin of each woman that you so expose. Will you ask why that people’s education proceeds slowly? Take bodies and minds bred and built on the lines thus indicated. Will you ask why the death rate is high and the people poor? Whether British or Russians or Japanese sit in the seat of the highest; whether the native princes divide the land, reviving old days of princely dominance; or whether some autonomy more complete than that now existing be set up, the only power that can hasten the pace of Indian development toward freedom, beyond the pace it is traveling today, is the power of the men of India, wasting no more time in talk, recriminations, and shiftings of blame, but facing and attacking, with the best resolution they can muster, the task that awaits them in their own bodies and souls. This subject has not, I believe, been presented in common print. The Indian does not confront it in its entirety; he knows its component parts, but avoids the embarrassment of assembling them or of drawing their essential inferences. The traveler in India misses it, having no occasion to delve below the picturesque surface into living things as they are. The British official will especially avoid it–will deprecate its handling by others. His own daily labors, since the Reforms of 1919, hinge upon persuasion rather than upon command; therefore his hopes of success, like his orders from above, impose the policy of the gentle word. Outside agencies working for the moral welfare of the Indian seem often to have adopted the method of encouraging their beneficiary to dwell on his own merits and to harp upon others’ shortcomings, rather than to face his faults and conquer them. And so, in the midst of an agreement of silence or flattery, you find a sick man growing daily weaker, dying, body and brain, of a disease that only himself can cure, and with no one, anywhere, enough his friend to hold the mirror up and show him plainly what is killing him. In shouldering this task myself, I am fully aware of the resentments I shall incur: of the accusations of muck-raking; of injustice; of material-mindedness; of lack of sympathy; of falsehood perhaps; perhaps of prurience. But the fact of having seen conditions and their bearings, and of being in a position to present them, would seem to deprive one of the right to indulge a personal reluctance to incur consequences. Here, in the beginning of this book, therefore, stands the kernel of what seems to me the most important factor in the life and future of one-eighth of the human race. In the pages to come will be found an attempt to widen the picture, stretching into other fields and touching upon other aspects of Indian life. But in no field, in no aspect, can that life escape the influences of its inception. “Slave Mentality””SLAVE MENTALITY” Beginning and end of Chapter 2.
Who do you believe? The Tyrant Or The Disciple? MK Gandhi As Slave Not. Quotes by MK Gandhi in memory of those redeemed.